The iconic, 4th century, bronze winged lion on top of the granite column in the piazetta as viewed from the top of the clock tower right across the Piazza San Marco! Note the gospel beneath its paws which is a later addition, along with the wings. Status was paramount in the ancient world. For empires, as much as for ordinary citizens. The aura of power, as important as the exercise of power itself. Visual imagery and symbolism went a long way in engendering that impression. And so it was, that a maritime republic of the stature of Venice, felt the need to be associated with a patron saint of greater eminence than their humble Saint Theodore. An elaborate myth was created therefore, around the legend of a prophesy that the Venetian lagoon would be the final resting place of the apostle Saint Mark, which was then used to legitimize the smuggling out of his remains from his tomb in Alexandria. And the winged lion, the symbol of their exalted new evangelist saint, became their state emblem. Many winged lions survive the republic in the erstwhile colonies around Dalmatia and Istria. One in Trogir, in present day Croatia, is supposed to have held a book that read “Let God arise, and let His enemies be scattered”. Legend claims that the lion closed its book when news of the fall of the Venetian republic reached the city! No amount of online searching yielded an image of a Venetian lion in Trogir that corresponded with that story. Shall have to go looking for him in person. Meanwhile, here is a gallery of Venetian lions in a belated tribute to the mighty beast. Happy travels……….no matter where life takes you. Do check out the fascinating article to read how the author Saša Iskrić Smrekar arrived at these conclusions. You are right, the lion sculpture pre-dates the gospels even, to the 4th century BC! The wings and the book were added much after it was associated with Saint Mark and after the winged lion became the state symbol. This post is about that lion symbol and not about this particular sculpture in isolation. Thanks for reading Mihrank. Wow, I didn’t know about the Venetian lion. Is that statue really 1700 years old? A very fun post, Madhu. I love the photos and the stories. Thanks for doing all the legwork, and collecting the lions for our convenience! So glad you put a collection of your Venetian lions together for us Madhu – especially the less well-known ‘domestic’ incarnations of the beast, and from the vantage of the clock tower. You are most welcome Meredith. I regret not having made it to the lions near the Arsenal. Thank you. Your post was the inspiration Marina. This was my belated tribute. Can’t wait to go looking for that lion in Trogir Lynne! 🙂 Thanks for the biblical story behind the symbol. Aww, thank you Ian. Kind of you. I first saw the image of the winged lion back in 2000 on the emblem of the Italian city’s football club. I’ve always been fascinated by such imagery and symbolism, the one blends culture, myth and legend. Those winged lions alone are enough reason for me to visit the city. 🙂 Great shots, Madhu! Adopting this symbol surely tops the list of strategic moves by the erstwhile Venetian republic! I agree, the winged lions alone justify a visit to Venice 🙂 Thank you Bama. Wow..i dint know about the venetian lion.. your posts are so informative. Love reading them madhu. Thank you for reading and for your appreciative comments Divz. Have a great Sunday!. Jemmrose, appreciate your visit and compliment. I enjoyed reading your travel post on Pisa. Look forward to reading more at leisure. It makes me wonder how many myths have been ‘created’ in relatively modern times. It takes away the magic to know such detail doesn’t it? A very interesting post, fascinating how the symbol has spread so far and used so often in old buildings etc. I collected lots of winged lion photos too on my Venetian walks, but only one man with crocodile. lovely lions, thanks, I was in Venice just last month. The lion is a very appealing symbol, no wonder they are so popular! My favourites are the huge ones over by the Arsenale, and I also came across some by mistake, when I got lost, as you are supposed ti do in Venice, and ended up by the ‘ Ospidale’, which has lions in the stone relief on its facade. 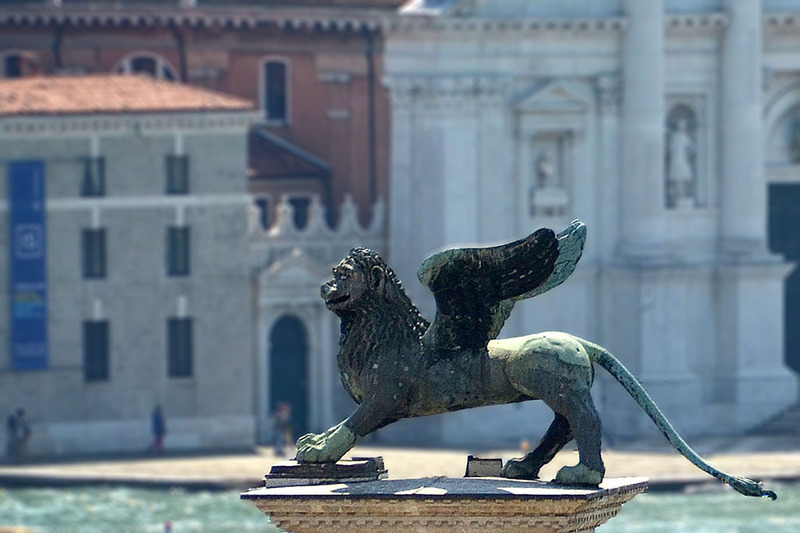 Do you know that one of the lions in front of the Arsenale comes form the Greek island of Dhelos? I promise I shall Sid 😀 Thank you for reading. Most intriguing post, Madhu. I have been looking online for the lion from Trogir (could not find anything). The last time I was in Trogir I was still a kid, and don’t remember much. It is possible that the said lion disappeared in 1932, when eight Venetian lions were destroyed. The soldiers of the Kingdom of Yugoslavia destroyed them seeing them as threatening symbols of Italianisation of the entire Adriatic east coast. Thank you Paula, shall pass on your good wishes. Oh Madhu I am so happy to see these! I want to return to Venice badly so I will live vicariously through you, thank you! Lovely post and great tribute to the Lion too, Madhu! Thank you Dina. Have a great Sunday! 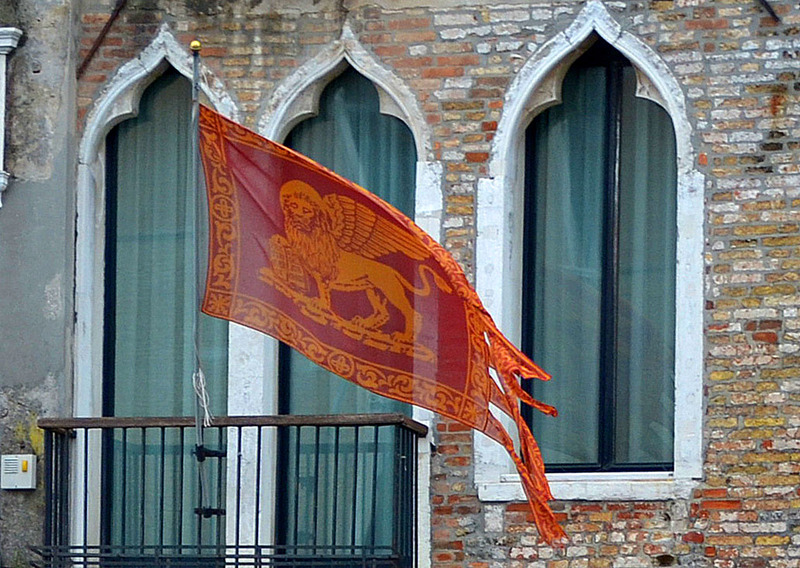 The lions are definitely throughout Venice … and I like especially liked the winged lions. That emblem is so familiar, but I never knew the story behind it. Thanks! You are most welcome 🙂 Thank you for reading. The lions are beautiful, and the light in which you have taken these epicures just glorious, Madhu! Thanks! That must have been a magnificent entrance! Do have photos of the lions Sylvia? Pity you couldn’t take them with you. I hope one day to be able to visit some of the interesting places you paint so well with your words Madhu. One learns something NEW everyday .. I learnt about Venetian lion.. Thank you .. Your are welcome Bikramjit. Thank you. Jo I have been meaning to ask, how are you able to like a comment? Is there a like button below each comment on my blog? I don’t remember enabling it, and I can’t see any like buttons when I am signed in. Have been getting notifications of likes though!! Thank you for the insights on the winged lion, Madhu! I ahve patented the Unicorn, preferably with wings to fly me to my dreams! This is in-depth form of traveling. Learning about the place deeply. I never even noticed these lions. Great observation, Madhu. I applaud your thirst for knowledge, and I thank you for imparting it with us. The “open book means peace” and “closed book means war” is actually wrong – there are four possible combinations of book and sword and each has a different meaning: open book and no sword (lowered sword) symbolises the venetian republic itself, closed book and no sword means delegation of sovereignty, open book and raised sword sybolises the judiciary, and closed book with raised sword meas “tax free zone”. That was a fascinating read!!! Your arguments make a lot of sense. I did think the ‘Peace-Open, War-Closed’ theory sounded weak. I appreciate your stopping by to read and comment. And somehow the link to the text is missing …? Oh, I assumed you were the author and commenting under another name. Shall correct it right away. The word ‘article’ is linked to that post and seems to work fine for me. Have now added a link to Sasa’s Twitter profile as well. Imagine the planning meeting for smuggling the remains and well done on the winged lions being the winning proposal for the perpetuation of sovereign power! Makes you wonder what symbols will endure from our time into classical history. A wonderful post, thank you Madhu! Beautiful article informative and educative. Refreshed my memories of a visit years ago as well learnt much more. Thanks Madhu. Thank YOU dilip. Glad you enjoyed this. Happy Sunday!